With all this talk about Jenny Macklin and her comments about living on Newstart, it is time that we talked about what might be in store for our country should Abbott become Prime Minister. Here is the latest guest post from my mum, Kay Rollison. The mainstream media, almost without exception, accept that Tony Abbott will win the election due this year. But they are not telling us what we might expect from an Abbott government, and nor is Abbott. So we can only speculate. What we come up with might not be what Abbott and his media friends will tell us when the opposition get round to making election promises, but it’s what will likely drive a LNP government – because it always does. First some caveats. What an Abbott government can get will depend partly on the politics of the Senate, unless they have a majority there, which seems unlikely. The Howard government was a big spender and Abbott’s view of the economy – in so far as he has one – seems to owe more to Howard practices than to the economic rationalism favoured by his party. Maybe his mentor B.A. Santamaria also influenced his thinking. Or maybe he just has no idea. Don’t expect economic consistency. The LNP, at least in theory, supports small government, with low taxation and balanced budgets. Not only are they happy to cut government spending, they will have no choice but to cut government spending if they aren’t going to increase taxation. One area they are likely to target is welfare. They have a track record on this – see the 2006 Welfare to Work changes. It is also what other conservative governments such as David Cameron’s British Tories are doing. When they have no new ideas of their own, they copy their mates. 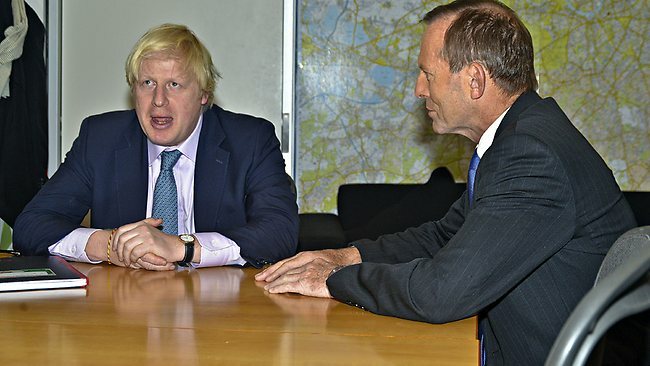 What do you think Abbott was doing in London in December –aside from hiding out from the Ashby judgement? And we have some comments from the Shadow Treasurer Joe Hockey which show support for welfare ‘reform’: his ‘end of the age of entitlement’ speech in London in April 2012, and this tweet in support of Cameron’s proposed changes. Before we get on to what those changes entail, it’s important to remember that the deregulation of the Australian economy, which is supported by both sides of politics, involves a hands-off approach by government, which is left with only crude tools like unemployment to keep down inflation. Both sides also accept that deregulation means there would be losers and that there must be a ‘safety net’ to support them. So what’s the difference on welfare between Labor and the LNP? Well at the moment, not very much. But there will be large differences if we go down the British Conservative path – as I have no doubt Abbott will do. We already have his statement from the 2010 election campaign that he would like to see dole payments stopped to able bodied people under 30. The British Conservatives are singing from the same songbook as Hockey did in his ‘end of the age of entitlement’ speech. At the time, we sneered at what Hockey said, because just then, the LNP were busy opposing the Labor government’s attempt to strip back an outrageous piece of Howard era middle class welfare – subsidies for private health cover for the rich. And then there is Abbott’s ridiculous paid parental leave scheme which would pay the wages of well off women taking maternity leave. It seems the Liberals think the middle class are entitled to government support. But this isn’t about middle class welfare. What David Cameron has in the gun is what he calls the culture of welfare dependency. Cameron is back on the old furphy we have seen so much of in years past – the unemployed are dole bludgers, who need to be forced to find a job. It’s the ‘strivers versus the skivers’. The Conservatives are offering voters a choice between spending public money on ‘hardworking families’ or ‘people who won’t work’. Sound familiar? The main proposal is to cap the amount of welfare a family can receive to ensure that it is less than the average earnings of working households. They also intend to institute tougher tests for disability support. You can read more about it here. The Conservative government expects to save billions of pounds by this – and you can’t do that without hurting the most vulnerable members of society – the very ones the safety net is supposed to support. The sad part is that Britain has an average unemployment rate of 7.9%, and the rate is much higher in some regions. Where are the unemployed supposed to find a job –given that the Thatcher government destroyed the British manufacturing industry and no one since has found a source of jobs to replace it? The Howard ‘reforms’ assumed that the unemployed, some people on disability pensions and single parents with children over the age of eight could find part time work if their benefits were cut. Abbott will follow Cameron further down the ‘work not welfare’ road. There’s his ‘green army’ for a start. But we know that much part-time employment is casual, poorly paid and has poor working conditions. Tough luck, as far as the Liberals are concerned. And there is no guarantee that even part-time work will be available. So it will mean more futile job applications, more breaching, more misery. So, under the Liberals, we would have an even more draconian approach to welfare than the one we have now. Everything about the British approach fits with what we know of the Liberals. Remember the Paxtons? I can just see what the LNP election spiel will be like. And will they ensure that government stimulus increases the number of jobs? I don’t think so. Labor has a real chance to differentiate itself on welfare. It is true that they accept the safety net argument, and treat a level of 5% unemployment as normal, and even desirable to curb inflation. It’s true that they are starting to bring out ‘dignity of labour’ card, as if being in work was a virtue, and being unemployed a moral failure. On the other hand, it is reasonable to be concerned about welfare dependency, and children growing up in jobless households. If you want to generate and sustain a permanent under-class, that is the way to do it. Merely abstaining from bashing the unemployed would differentiate Labor from the LNP. Labor is looking to increase the Newstart allowance, acknowledging unemployed people need proper support. But they could go further, with a whole of government approach to poverty. This would include better health and education for poor people, better access to vocational training, and perhaps most importantly, better pay and conditions for part-time work and a decent minimum wage. People should not be condemned to stay in the welfare system because they have no other alternative. Let’s cut back on some of that middle class welfare to fund a fairer society. Labor needs all the support and encouragement we can give it to take the road that is socially responsible, and ultimately better economics. After all, look where austerity is getting the UK. You are so right Kay. I’ve just started reading “Deer Hunting with Jesus – Dispatches from America’s Class War” by Joe Bageant. He tries to answer the question, “Why do the poor working class Americans often support the Republicans?” This also bothers me with the Australian working class – the “Westies” etc. He is discovering that it is the “culture war” against the latte drinkers, the middle class urbanites (which the working class in America hate and Fox and Murdoch cater to that hate) which makes them vote against their own interests. I’m afraid it is no different here in Australia. The “westie” unemployed begrudges the help an asylum seeker receives in a detention centre. The LNP (as all conservatives) stoke fear. They have mastered the dark art of racist / homophobic / misogynist whistle blowing. However, I believe that Labor will win the next election as long as Abbott is Opposition Leader. There is no doubt that the social welfare system in Australia is in need of an overhaul. I do not pretend to know what the answers are as I have no experience in those matters either academically or by experience have never been unemployed prior to my retirement. However I am confident that the expertise to refine the system does exist if only both sides of the political divide had the intestinal fortitude necessary to make difficult decisions. Unfortunately I do not believe that Mr Abbott has either the interlectual & economic literacy (despite his university education) nor does he have the moral fortitude required to be anything other than a political populist. This is very unfortunate for Australia as I firmly believe that the Colation will win the next election in a canter. Ms Gillard has demonstrated her moral, an interlectual superiiority to Mr Abbott but unfortunately the talent pool in the current Labor government seems to be very shallow. Poor old Wayne Swann appears totally out of his depth as Treasurer & is unable to support Ms Gillard in her endeavours to make the necessary reforms for the economy. Not many of his colleagues inspire deep confidence either, however the same comments could equally be applied to the Colation. After re-reading what I have written I now feel sad for our future following the up-coming inevitable change of government. Is there not someone in the Liberal Party with the courage to get rid of Mr Abbott before he has the opportunity to damage the country with his lack of interlectual talent & his moral baggage. Kay, I totally agree with Stavros regarding the prescience in ‘Deer Hunting With Jesus’. A truly great and mesmerising work. It does indeed attempt to unwind the utter mystery of ‘turkeys voting for Christmas’ with the flocking of blue collar voters to the rabid right wing. Joe even foretold the GFC, when he spent some time with a mortgage broker approving loans for people with no credit, no job (and, as it turned out, no capacity to pay the monthly). So much of the book is, as Stavros states, spot-on for Australia. Recommended. As the old saying goes, for every complex problem, there is always a simple solution – and its always wrong. Thanks Kay – I agree, except for when you write what Abbott ‘will’ do. I think we must stop projecting the notion that he is in the chair already, and say what he ‘would’ do. John Byrne – lighten up! It’s a terrifying prospect, that’s sure, but it hasn’t happened yet. Other books worth reading are “The Empire of Illusion” by Chris Hedges, which points a sharp finger at Rupert Murdoch, and “Days of Destruction, Days of Revolt” by Chris Hedges with Joe Sacco. While these books are about the US and it’s social horrors, we are influenced by and not far behind with the same corrupting virus of corporate abuse, bastardry and environmental/social erosion happening in our own part of the world. It is a strange world we live in sometimes. Why is Tony Abbott running around pretending to be one of the boys in a mans world. Pretending to be some average working guy who hates Trade Unionists and who really hasn’t worked on a assembly line day in day out for most of his life or swung a pick with the best of them who used to dig trench foundations by hand. Nowadays it is done by a hydraulic digger machine and Tony wants to play around with them for 10 minutes or so. Then go on his merry go round ride looking for more crowds to spread his gospel truth one liners. Then it boils down to this. Does Tony really read all the information he is supposed to as a sitting member of parliament or not. All I can remember about Tony Abbott is when he was Minister of the Health under Howard and Johnny Boy wanted to go to War, thus didn’t have the cash. Abbott said that is easy we will take it away from the States Health funds for a while. So off to War we went and we are still there costing lives and far too much of the Australian Taxpayers hard earned cash. Why? Do we hate Muslims and must stop the boats at any cost and send them back to where ever they had come from. Anyway I think your Mum has hit Tony’s nail on its head and hard. Good stuff Mate. Good post, and I generally agree with its conclusions.Though I feel compelled to say that my parents were also mentored by B A Santamaria, and they and their peers consider Abbott’s adoption of economic rationalism as a betrayal of Santamaria’s ideals.